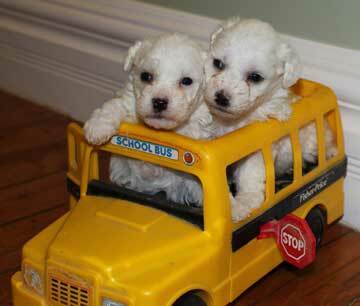 You are here: Home / Bichon Frise Puppy Care / Distemper in Dogs – Is Your Bichon Frise at Risk? Distemper in Dogs – Is Your Bichon Frise at Risk? 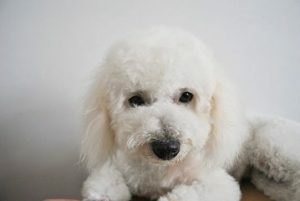 Distemper in dogs is one of the most serious diseases that your Bichon Frise puppy or dog can get. Canine distemper is a virus, a paramyxovirus, that affects the whole body and is highly contagious. Most puppies from reputable breeders are immunized against distemper, but caution should still be taken, as the virus is present all around the world. Distemper in dogs is most severe for puppies because of their immature immune systems. 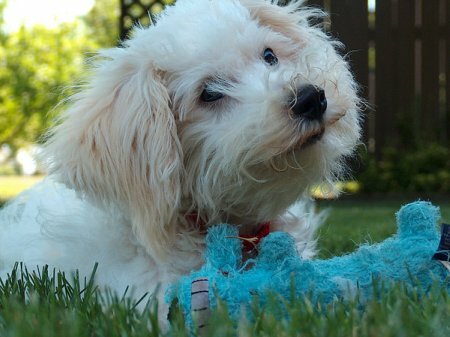 Routine vaccinations can help keep your little Bichon Frise puppy safe. Of course your dog can get canine distemper from another dog or a cat. But did you know that she can get the virus from wild animals like foxes, wolves, coyotes, minks, ferrets, skunks, raccoons, lions, tigers, bobcats and even seals? Which Dogs are at Risk for Dog Distemper? Distemper in dogs is a virus that attacks the whole body of a puppy or dog. The virus is highly contagious and that is a very good reason for keeping your dog isolated from other dogs and wild animals for the first eight weeks of her life. The virus is spread when an infected animal breathes out the virus and another animal breathes in the droplets of virus particles. When food and water bowls are shared, the virus can be spread. And the puppies’ mother can transmit the virus to the puppies through the placenta. So close contact is necessary to spread the disease. An infected dog can spread the infectious virus for several months, even after the symptoms of distemper have disappeared. If a young dog gets the virus and does not die, she may be permanently impaired for the rest of her life. Sadly, the death rate for puppies who get distemper is close to 80%. The canine distemper virus is the number one disease threat to dogs of all ages. Puppies are certainly the most vulnerable dogs for distemper. But older dogs can get it too. Sometimes, when a dog has had distemper as a young dog and survived, the disease can surface again. Usually in this case, the central nervous system is affected. Occasionally, an older dog will develop symptoms when he did not show symptoms as a puppy or young dog. The symptoms, in this case, progressively get worse, and they are seen as central nervous symptoms, eventually paralysis. If you have more than one dog or cat, be especially careful about sanitizing everything they touch. Fortunately the distemper virus is easily killed by using a good disinfectant. Distemper shots are recommended for all puppies, and most breeders will give puppies their first shot at 6 weeks old. 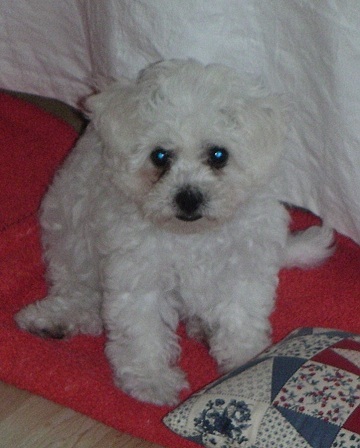 Distemper in dogs often strikes little puppies like this Bichon Frise. After that, puppies should receive vaccinations every 2-4 weeks, until they are 14-16 weeks old. Some vets suggest an annual vaccination after that, because an older dog who is stressed or has his immune system compromised, can also get the distemper virus. However, usually an older dog does not get as sick as a puppy. So how would you know if your dog has distemper? The tricky part about identifying distemper is that the symptoms vary and are not typical for every dog. Because of this, many people don’t realize that there is a serious problem, and they put off going to the vet. Trips to the vet can be very expensive. So if you want to make sure that your puppy or dog is OK, without a $250-300 trip to the vet, you can test your dog at home for distemper. Two test kits are available: Dogstory Canine CDV Canine Distemper Test Kit and the Qjoy Canine Distemper Virus Test Kit. Fever – starts 3-6 days after exposure to the virus. The fever will go away and then another will start, lasting for about a week this time. With the second fever, you may see discharge from your dog’s nose and eyes. Skin and foot pads – overgrowth of the foot pads. The pad becomes thickened and crusty. Inflammation of the brain and spinal cord – These symptoms get worse over time. Infection by the distemper virus can be mild, with few or no symptoms, or it can be severe, with the symptoms shown above. Half of all dogs infected with distemper show no symptoms at all. Treatment is aimed at limiting or reducing any secondary bacterial infections, keeping the dog hydrated and controlling the symptoms. However, there are some new products that show hope for helping your dog get over an attack of distemper. If you subscribe to Amazon Prime, you can get fast, free delivery. You can try Amazon Prime for FREE for 30 days here. Dietary supplements – Canine D-T is a natural brain and nerve support supplement. Developed for pets with distemper. It is best used with Vibactra Plus and Derma Nerv. Meds to reduce the fever – Giving your dog an aspirin powder for pets will help reduce fever and soothe some of the pain. Treatment for pain – A good pain relief medicine will help relieve some of the pain and discomfort of distemper. Unfortunately, if your dog has neurological symptoms like those listed above, treatment is not usually successful. Your dog may be permanently disabled or she may not survive. At some point, if treatment will not be successful, you may have to consider euthanasia as a merciful alternative.